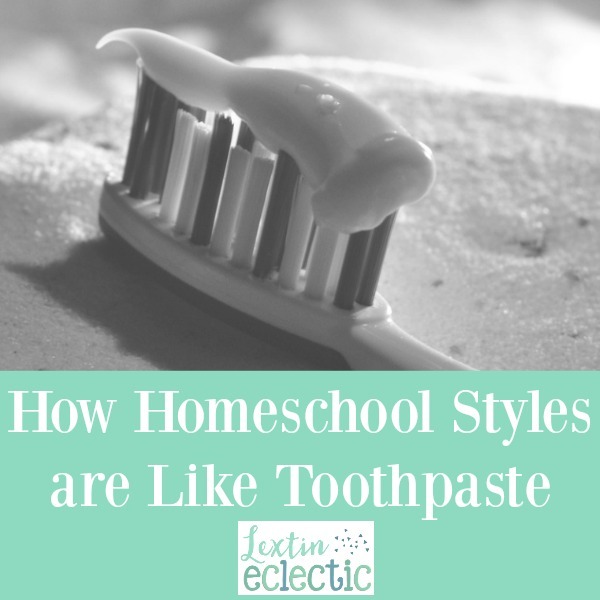 Homeschool styles are like toothpaste. Well, let me explain my little analogy. My husband and I have been married for 14 years. We have very few disagreements. However, there is one topic on which we cannot agree – and that is the correct way to squeeze a tube of toothpaste. Now, my husband prefers to slowly roll up his tube from the bottom. It’s carefully creased and folded up each time he uses the toothpaste. I am apparently the uncivilized person who squeezes the tube from the middle. It’s been a huge disagreement. To solve our differences we’ve resolved to each have our own tube of toothpaste and to never touch the other person’s toothpaste. And yes, my hubby can always tell if I’ve used his. Having separate toothpaste tubes has saved our marriage and ended our arguing and complaining. Are we crazy? It’s silly how something so small and trivial can cause such a big disagreement and huge conflict. However, the same thing happens in the homeschool community. We all homeschool our children. We all have the same basic goals in mind – to educate our children and help them learn. While we are all aimed at the goal of educating our children – we all take different paths on our route to achieve that goal. There are different homeschool styles and methods. Are you more classical, Charlotte Mason, eclectic, unschool, unit study, or textbook learning in your approach? Do you start school first thing in the morning or get a slower start to your day in the afternoon? Do your kids learn independently or do you direct all their learning time? What type of curriculum do you use? Do you plan your own studies or follow a preplanned curriculum? Do you prefer to do your work at the park or the library? Or do you have a dedicated homeschool space for learning? Is it better to have a routine or have more spontaneity in your day? Welcome to the toothpaste argument. In the grand scheme of homeschooling, none of these little details matter. It only matters that your homeschool style works for you. What matters most is that you are working toward the goal of educating your child. The path you take in order to achieve that end result will differ from another homeschool mom’s route. It’s not important though. Going back to my toothpaste analogy: The goal is clean teeth. I crush my toothpaste tube while my husband rolls his neatly. We both get the same toothpaste out of that tube. I’m thankful that during one of our arguments about the correct way to use toothpaste, my husband pointed out how trivial our disagreement was. Then he took our discussion one step farther, “Honey, isn’t this what all homeschool moms do? They argue about the silly details and the different ways to homeschool. None of that actually matters as long as they are educating their children. They’re forgetting the important thing to argue about the trivial things.” (We apparently have deep conversations while brushing our teeth at night). After our discussion, he handed me my own separate tube told me to go ahead and crush it if I wanted to. Can we acknowledge the differences while celebrating that we are all working toward the same goal? Get your own tube of toothpaste and don’t focus on what others are doing. I promise it will save your sanity and give you peace about your own homeschool. So, go out there and crush it, homeschool mom! Because that’s really the best way to do it anyway, right? Be sure to go back and read the other posts in this series. You can find them listed here.